SKU: S2864. Category: Mobility Scooters. We have just completed a 32 day trip overseas visiting 12 countries and using the Pride Go-Go LX scooter along the way. The freedom which this offered to Beverley was amazing and she was able to scoot around a cruise ship for 14 days, make shore visits at every stop along the way ( there were 8 stops ) and explore various cities in Europe with all types of pavements. We carried the scooter in a Volvo station wagon from Amsterdam to Vienna, assembling and disassembling it as we went. Battery charging was no problem at all. Although we obtained the necessary approval from airlines being Qantas, Jetstar, Cathay Pacific and Austrian, we had to educate ground staff at each airport as we went on our way – most were accommodating, some were wary of the battery, but all took the scooter on board and there was little trouble in having it returned to us at each airport. I thought that you would be interested in hearing what a serious test this was for such a small scooter and how its versatility proved itself over and over again. How can you charge the batteries of the Pride GoGo LX? 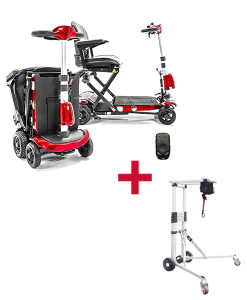 The Pride GoGo LX Mobility Scooter has a charger port in the tiller,but also comes with a convenient off-board dual voltage charger that can charge battery pack on-board or off-board. How easy is it to dismantle the Pride GoGo LX? The Pride GoGo LX mobility scooter comes with a Feather-touch disassembly feature which permits simple frame separation with only one hand. The frame design easily disassembles into 5 super lightweight pieces for convenient transport and storage. How many batteries does it need? It requires 2 12V deep-cycle (standard) 17 AH batteries. I travel to U.S.A alot can the scooter be recharged there? All our scooters has universal power charges. Power range from 110v - 240v.